Public concern over the debt and deficit, already extensive, is only likely to increase as the so-called “fiscal cliff” approaches at the end of the year. Yet among a dozen specific options for reducing the debt and deficit, only two win majority approval from the public – raising taxes on annual incomes over $250,000 (64% approve) and limiting corporate tax deductions (58%). A new national survey by the Pew Research Center for the People & the Press, conducted Oct. 4-7, among 1,511 adults, including 1,201 registered voters, finds that cuts in education spending are particularly unpopular. 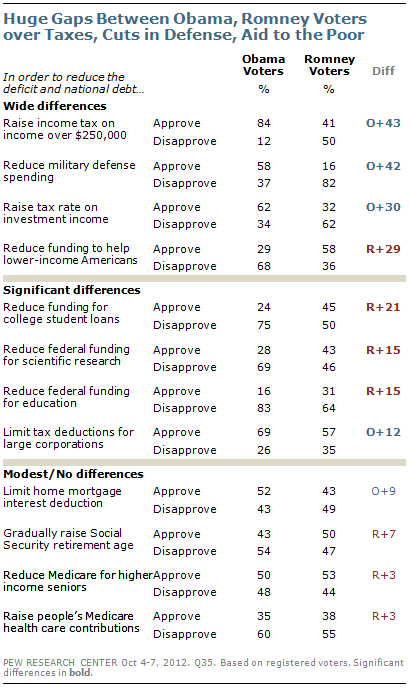 Fully 75% disapprove of reducing federal education funding and 61% oppose cuts in funding for student loans. 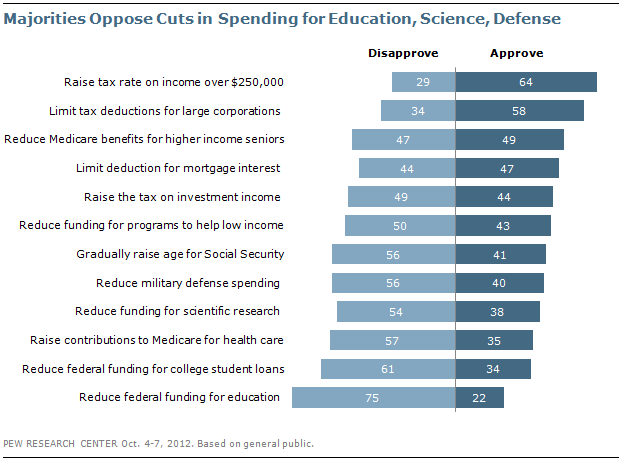 Majorities also oppose reducing military defense spending (56%) and funding for scientific research (54%). Opinion is divided over reducing funding to help low-income Americans (50% disapprove vs. 43% approve). There also is resistance to making changes in Social Security and Medicare to reduce the debt and deficit: 57% oppose raising the amount Medicare recipients contribute to their health care, while 56% disapprove of gradually raising the Social Security retirement age. About as many disapprove (47%) as approve (49%) of reducing Medicare benefits for higher-income seniors. And the public is split over limiting tax deductions for mortgage interest as a way to reduce the national debt: 47% approve and 44% disapprove of this proposal. The political divide over most of these proposals is substantial. The biggest differences between voters who favor Barack Obama and those who support Mitt Romney are over raising taxes on incomes over $250,000 and reducing military defense spending. Fully 84% of registered voters who support Obama approve of raising taxes on annual incomes above $250,000, compared with 41% of Romney voters. Most Obama voters (58%) favor cutting military defense spending to reduce the debt and deficit; an even higher percentage of Romney voters (82%) oppose defense cuts. While 62% of Obama supporters approve of raising taxes on investment income to reduce the debt and deficit, an identical percentage of Romney voters (62%) disapprove of increasing investment taxes. Similarly, while 58% of Romney supporters favor cuts in federal programs that aid lower-income Americans, 68% of Obama voters oppose reductions in programs that aid the poor. Among the 12 items tested, there is only one – limiting tax deductions for large corporations – that wins support from majorities of both Obama voters (69%) and Romney voters (57%).